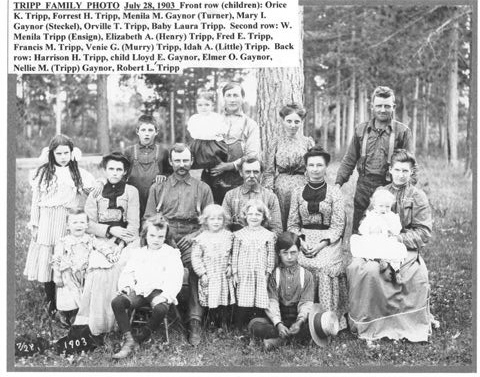 In 1901, my Grandpa Fred Ernest Tripp moved to Washburn County, Wisconsin with his wife and four small children. In those early years, Grandpa Tripp would farm in the summer and work in the woods with his brother Rob in the winter. He would buy a 40 acre plot of forest near the railroad stop in Springbrook, and then he and Rob would camp there for 4 days cutting pulp wood and sometimes logs. They would haul them to the rail depot and load them on the cars. The women and kids would handle the homesteads until they came home on weekends. I remember my Grandpa Tripp being very good with draft horses. One event I witnessed made a lasting impression on me. He and a heighbor had each contributed a pair of horses to pull a heavy well-drilling rig. The four horses could not get it started, and not being used to working together, and dealing with two drivers, they got more nervous and less able to pull as the minutes ticked by. Finally Grandpa Fred said “Let me give it a try with just my team”. He took some time to cool the horses off by holding their collars off their necks as he was talking to them to calm them down. Then, when all was ready, he finally gave the word, and I saw his two horses do what the four horses could not do a short time earlier. When I was as young as 6 (I am 92 now in 2013), Grandpa would put me on the seat of the binder in the field and let me hold the lines for a team of four while he walked beside. They would keep the machine going all day using 3 pairs of horses and 2 drivers. When one driver went to eat, he would bring back a fresh pair of horses, and the other driver would take a tired pair of horses home when he went to eat. My Grandpa Tripp was always very active in the community. When the Township of Stone Lake was formed in 1905, he became its first town chairman and served there until 1920. Later, Grandpa Tripp’s son, Forrest Harold Tripp, also served as town chairman of Stone Lake Township for about 20 years, and eventually became the county chairman of Washburn County. 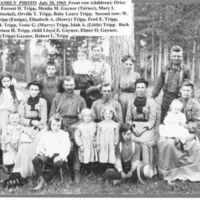 Tripp, Clovis, “Memories and family stories,” Recollection Wisconsin, accessed April 25, 2019, http://recollectionwi.org/items/show/5.